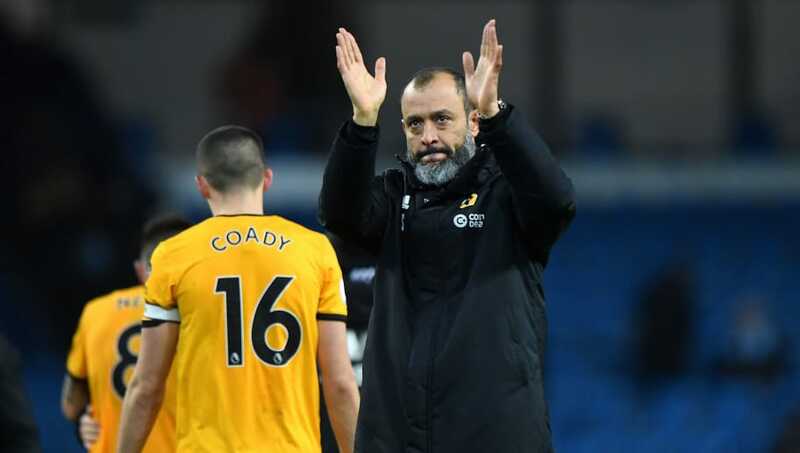 ​Wolves manager Nuno Espirito Santo lamented his side's numeric inferiority as his side lost 3-0 to Manchester City on Monday, but admitted the red card given to Willy Boly was the right decision. The West Midlands side were reduced to 10 men after 19 minutes, when Boly was shown a straight red card for a dangerous tackle on City's Bernardo Silva. The Citizens took full advantage, as two goals from Gabriel Jesus and a Connor Coady own goal sealed the win for the home side. Speaking to ​Sky Sports, Santo reflected on Boly's early departure from the match, saying: "The incident was very close to me, and I haven't seen the images but I've spoken with the fourth official. It was a red card, no doubt about it. "The red card was a moment in which we tried to change things and the boys tried. Playing with 11 is tough, but playing with 10 is even harder. "It was a tough night. Since we conceded the first goal, it became very difficult. We were in shape and it was a 30-yard pass which breaks us. "There's no doubt about the result, they controlled the game and had the chances." After Boly's sending off, Wolves conceded from the penalty spot as Ryan Bennett brought Raheem Sterling down in the box, allowing Jesus to to put City two goals ahead. The second half saw Wolves hold firm, but they were unfortunate to concede an own goal as ​Kevin De Bruyne's cross glanced into the net off Conor Coady in the 78th minute. Santo praised his side for their effort in the second half, adding: "We had a plan to stay in shape and show defensive organisation, but with the goal and the red card everything went down. "I think we showed character. We were brave, we stayed in the game and we always worked hard but we can't stop all the chances from ​Man City. We have to try to forget about it and look ahead." Despite the loss, ​​Wolves​ remain in 11th place and are only three points from seventh. They next host Leicester in a direct clash against a top-ten rival, and will hope to return to form to continue moving up the table.